That rumored Nokia Normandy Android handset is unofficially popping online more and more often, which means that there definitely is something to it. While Nokia is yet to unveil this handset that’s said to run a custom version of Android, renown leaker @evleaks has released what looks like a press image for the Normandy via its Spanish Twitter account. As you can see in the image above, the Normandy is expected to arrive in several colors – assuming the product will indeed hit stores – and we finally get to look at its user interface, which hasn’t exactly been made available in previous leaks. We will remind you though, that not too long ago, the same @evleaks provided a different set of images that show various apps running on the handset (see below). Getting back to the freshly leaked image, we’re looking at an app arrangement on the home screen that looks pretty much like Windows Phone’s Metro UI, although it’s not quite Metro UI, is it? We can also see various apps installed on the device, including Plants vs Zombies, and, from the looks of it, this device has dual SIM support. That said, Nokia is yet to unveil the Normandy, so we can get back to waiting for an official announcement. Anyone looking forward to a Nokia Android device, even if it’s an entry-level device that runs a forked Android version? 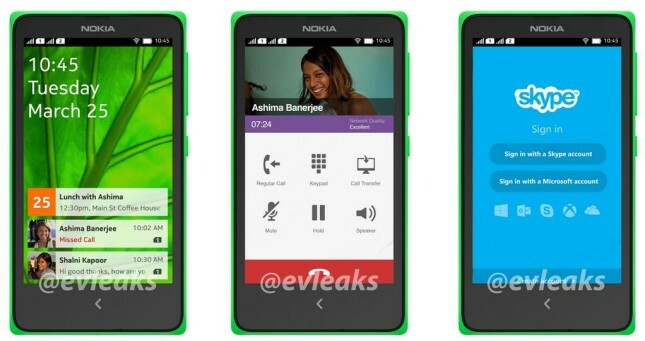 Nokia changes its Facebook and Twitter pages green, Android tease? What if Microsoft made Android smartphones?